After The Lovely Saint Nina (Betty/Buffy/Katherine) left me in Taiwan. She arrived back in Australia and was collected from the airport by our very good friend Len. It was a dark and stormy day. Huge thunder storms were raging and trees were down and many roads were blocked or closed by the intense down pours. The tunnel was flooded, so they took the longer, alternative route. This also had many problems and was detoured in parts by flooding or downed trees. As they approached our home in the storm on a narrow stretch of road, through the bush, a kangaroo jumped out onto the road directly in front of them and wrote off Len’s car. So Len the Unlucky and Betty, Buffy, Katherine the Forgetful, had to make their way home the last few kms in the rain to collect our car to get The Lovely’s luggage. Len borrowed our car to get home and for the next two weeks while his car was being fixed. So Len now collects me from the airport, in my turn, in my car, so that I can drive myself home. I’m home and its hot. Too hot for this time of year. I suddenly realise that although it was hot a lot of the time in Asia, the one thing that was missing was the smell of eucalypt oil. I step out of the car and crunch into the dry gum leaf detritus/compost in the gutter, blown there by the strong westerly winds. I know that I’m home. The air is baking and the eucalypt oil smell welcomes me. Annabelle Sloujetté has done a wonderful job of looking after our house and pottery. She is gone when I return, but I can see from the two tyre scorch marks in the lawn that she hasn’t been gone very long. The pottery is full to bursting with her new work and it’s very lively and an inspiration to walk into another persons studio, full of such exciting forms and decorations — even though it’s really my studio. It looks so different. Her work is so exuberant and joyful. The Blessed Saint Nina the Forgetful, Buffy/Betty/Katherine, has returned home before me a few weeks ago. But she isn’t here either. She is working up the hill, manning our display for the Southern Highlands Arts Festival ‘Open Studio’ Weekend at our friend Elizabeth’s studio. I wander around in my ‘new again’ old home and garden. 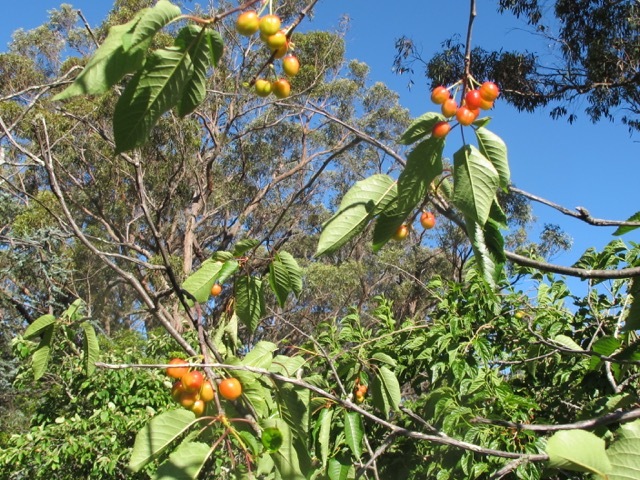 The cherries have flowered, set fruit, and the fruit is just now turning red. Almost ready to pick, they will be ready to pick in a couple of days. All this has happened in the time that I’ve been away. The air is hot and dry and it is perfect weather to ripen fruit. 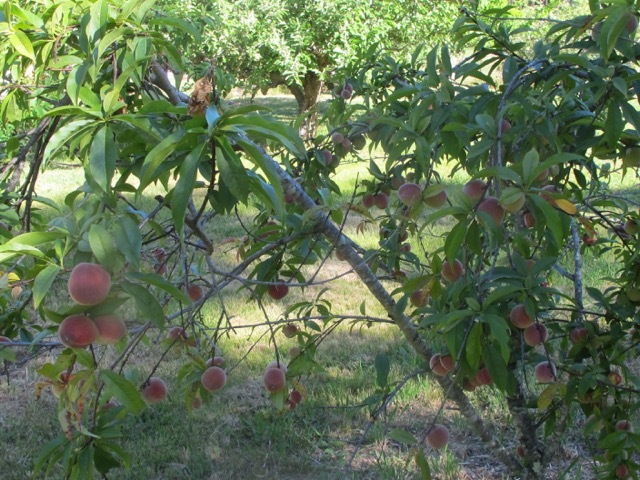 I walk around the garden and the stone fruit orchard. Everything was still pretty dormant when I left 10 weeks ago. It was really just the end of winter. Now, however, it is late spring and there is plenty to see. 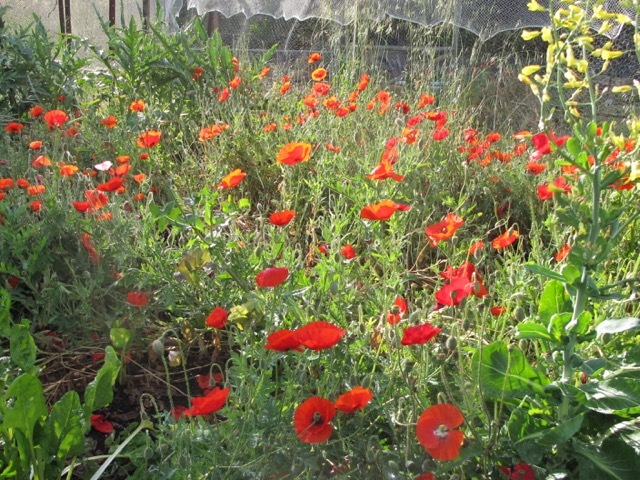 The single red poppies are out in force for the 11th of November and the nasturtiums are also adding a burst of colour in little clusters all around the garden. 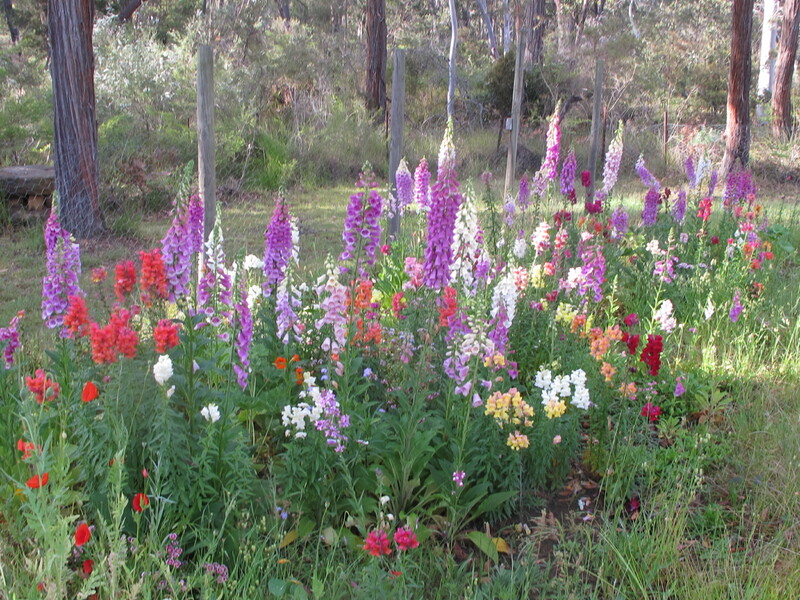 We don’t plant them any more, they just come up nowadays. We did plant a few seeds, many years ago, and since then they just keep on coming up everywhere. I don’t know how they migrate like they do, but they just seem to manage it somehow. 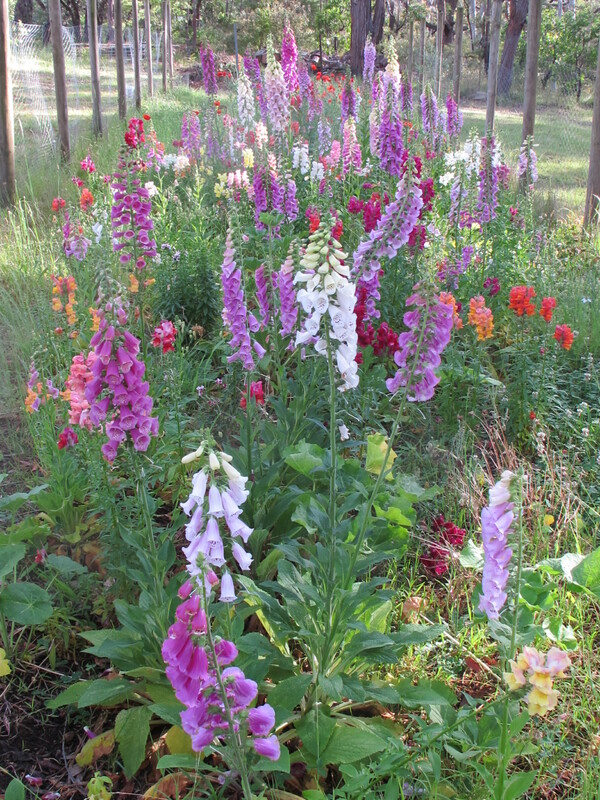 I planted a small area, down in the Pantry Field Garden, to English cottage garden flowers a couple of years ago. It was a surprise for The Lovely One. She loves flowers, so after I ploughed up the area for potatoes, I left half of the ground for English flowers as a present for her. 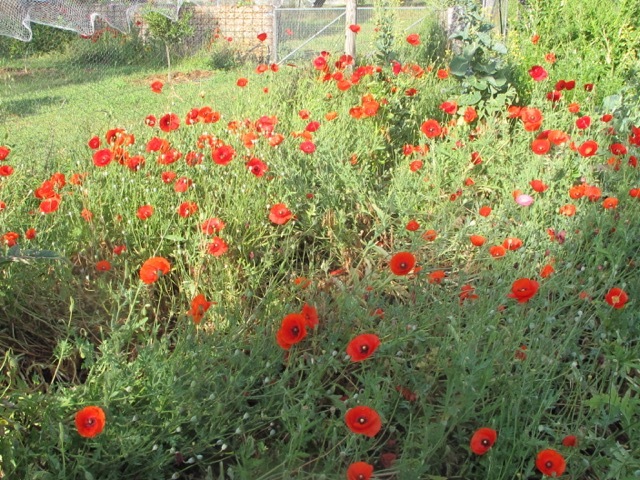 I broadcast 2 packets of ‘English-Country-Garden’ flower seeds into the freshly dug ground and watered them and waited. Sure enough, there was a small show of some annuals that year, but there were also a lot of bi-annuals setting their roots down for a great show for this spring. After looking at all the other parts of the orchards and gardens, I make my way all the way down to the Pantry Field. I can see a burst of local colour. It worked and it looks good. A small gesture, but a pretty one. It only survives the predation of all the local herbivores by being enclosed in a wire mesh fence. Not too pretty, but essential in these circumstances, if the plants are to survive long enough to flower and set seed. 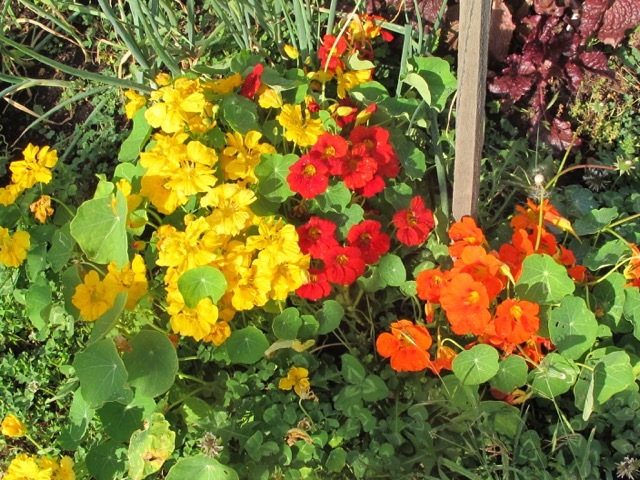 I’d like to see this little patch of English country garden flowers self-sow and regenerate on its own in future. There are mulberries ready to pick, plus strawberries, and the very early Sherman peaches have turned red. 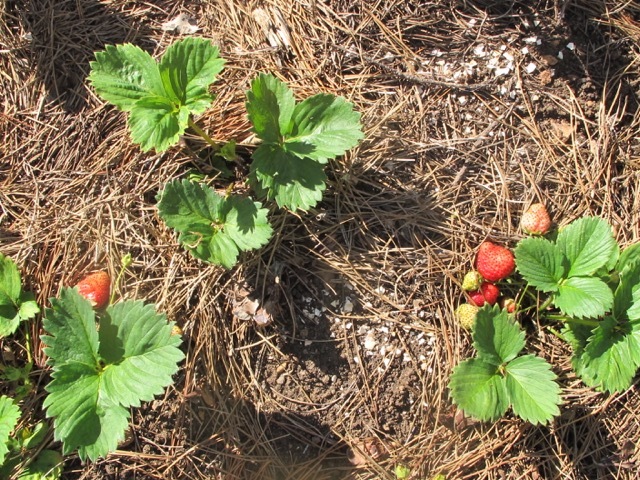 I taste one, Yes, they are already ready to eat, soft, sweet and deliciously warm in the sunshine. The juice squirts out and dribbles down my chin. I slobber and slurp the delicious sweet warm fruit and its juices. One isn’t enough. I take a second and then a third. My fingers are sticky with the juice. My lips and chin are warm and sticky. I need to go into the house and wash myself. Such are the simple natural pleasures of the fruiting season. The Divine Saint Nina – The Forgetful turns up. She has been out visiting other studios. It’s lovely to see her again. I missed her. We have always traveled together up until this time. We planned to, but circumstances intervened. We settle back into our natural routine. Janine opens a new jar of marmalade, it’s sensational. I’ve really missed that taste for some months now. I’m sure that there is some factor of absence at work here, making the taste buds grow fonder, but this jar is really nice, so flavoursome. That lovely tang of the sweetened citrus flavours, but there is something else too. I pick up the jar and examine the small hand-written label. It’s my writing, so it’s one of my batches. It tells me that on the 22nd of July, I used Seville orange, Chinnotto, Meyer lemon, — and the secret ingredient in this batch, which may be why it tastes so extra good, is the addition of prune brandy stirred through the mix, just before bottling. I’d forgotten about that. We had made some prune brandy a couple of years before, just as I make cherry brandy most years. It’s a simple operation of pouring brandy over the fruit in a sterilised glass jar and screwing down the lid. You forget about it for a year or two in the back of the pantry cupboard and just leave it to sit and develop. I always include the pips, because the best part of the flavour comes from the tiny amount of cyanide that is in the pips. This is slowly dissolved in the alcohol and gives the brandy a fruit + almond flavour. Yes, almond flavour is the flavour of cyanide. Just in case you didn’t know. And it’s fantastic, as anyone who loves amaretto will attest. So what made this marmalade so good was that last-minute addition of that rich flavoursome brandy stirred through just before capping off. Wow. So good! I struggle through the fruit-box-full of letters, parcels, junk mail and other postage that has accumulated over the couple of months. Then I start to deal with the hundreds and hundreds of emails, all queued up and waiting to be sorted, some answered, but mostly trashed. Still, they have to be looked at, so that I can decide which button to press. It’s late when I head off to bed. The Divine Miss N is long gone. I slide quietly under the covers, when suddenly, Buffy springs her trap. She flicks the sheet over my head. I know that resistance is futile and surrender to my fate. Fond regards from Buffy and her fresh meat.